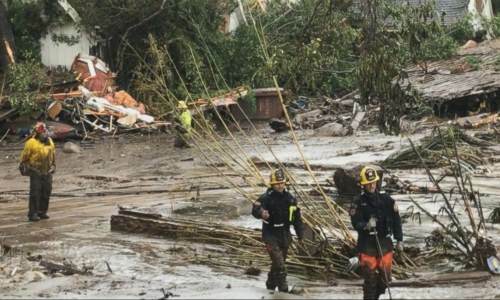 Recently, Southern California has been being hit by a spate of deadly mudslides. Video available online shows rivers of mud careening down streets, carrying cars along in the flow. Twenty people have been confirmed killed and 28 injured, with 8 more people unaccounted for at the time of this writing. While not on the top of most people’s disaster risk checklist, mudslides are extremely dangerous. We can see that by looking at what is happening in California. But as mudslides go, these have been rather minor. In 2010, a mudslide swallowed an entire town of 300 homes in the state of Oaxaca, Mexico, as people slept in their beds. Rescue efforts were hampered by damage to the roads, which had to be cleared before workers could get to the town. Mudslides, like avalanches, can happen very quickly, giving little to no notice. But that doesn’t mean that we never have any idea that a mudslide can occur. Certain conditions are required to cause a mudslide and those are well understood. The technically name of a “debris flow” is probably a better description, than the more common term of “mudslide.” That’s because a mudslide will carry along any loose debris it can find. If you’ve ever seen a flood or a raging river, you should have a pretty good idea of the power that massive amounts of water can have. Just turn that water into mud, which buries everything in its path, and you’ve got a pretty good idea of what a mudslide is, even if you’ve never seen one. Video first seen on Fox News. So what causes these natural disasters? As we all know, mud is made up of soil and water. What’s required to create a mudslide is lots of water and an area of loose soil that the water can soak into. If that area of soil is on a hillside and there’s nothing to keep it from flowing downhill, it can easily turn into a mudslide, taking boulders, trees and anything else it can find along with it. The lack of anything to stabilize the mud is a critical component of mudslide formation. The roots of grass, trees and other plants do much to stabilize the ground and prevent erosion. When those are eliminated, there is little to ensure that a mudslide can’t happen. So if you live on a mountainside or at the base of a mountainside, and the power company comes along and clears a swath of trees uphill of you, so that they can put in a new power line, you need to be aware that they may have just created the opportunity for a mudslide. The same can happen in many other ways, such as if someone builds a home uphill from you. A forest fire can even create the conditions to make a mudslide possible, burning off the plant growth that stabilizes the hillside. Of course, mudslides need a mountainside to form. So you’re not in much risk if you happen to live in the middle of America’s Breadbasket. But anyone who lives in mountainous areas or at the foot of a mountain should understand that mudslides are a very real risk. The steeper the mountainside is, the greater this risk becomes. Be aware of the risk your home has of being caught in a mudslide. Look at what is uphill from you and how well the soil is stabilized. If you are unsure, ask for help from the U.S. Geological Survey or your county Geological Survey office. They can tell you if your home is in a location with a potential for mudslides or not. Also keep your eye on any construction uphill of you, as that increases the risk. Okay, so let’s say that you’re doing all that, and a mudslide comes. What sorts of things do you want to avoid doing, so that you don’t end up becoming one of those statistics? Awareness is the key to avoiding being caught in a mudslide. Not only do you need to be aware of whether or not you are in a mudslide-prone area, you also need to be aware of the weather. Mudslides need massive amounts of water to form. They are typically caused by massive amounts of rain, such as that which a hurricane brings. That’s what happened in Oaxaca, Mexico. Rain from a hurricane pelted the mountainside, weakening the soil and eventually causing the mudslide. But rain is not the only weather condition that can cause a mudslide. The rapid melting of snow in the springtime can as well. In fact, any condition that can cause a flood, can also cause a mudslide. The only real difference is whether the water has enough dirt in it to turn it to mud. A battery-operated NOAA weather radio will provide you with notification of any natural disaster, including the risk of mudslides. If a mudslide warning is given for the area in which you live, the best thing you can do is to put your bug out plan into effect. Mudslides are not the kind of disaster that you can count on riding out in your home, like some people try to ride out hurricanes. While the devastation caused by a mudslide is usually limited to a very small area, it is often total in that area. Several homes in California simply ceased to exist, when the mudslide hit them. There is just too much force in a mudslide for the average home to survive. The other problem here is that mudslides happen rapidly. By the time you become aware that one is happening that could affect you, it is too late to evacuate. About the only thing that evacuation could possibly do is ensure that you are caught in the open, rather than in the relative safety of your home. With any mudslide, like any flood, you want to get as high as you can. The absolute worst place to shelter is in your basement or in an underground bunker. If the windows of your home break or if the mudslide manages to break through a wall, mud will begin to fill the basement, trapping you. Can the mud break through a wall? Probably not… at least not by itself. But mudslides carry rocks, tree branches and even entire trees along with them. Those things can break through a home’s wall, even a brick wall when they hit with enough velocity. If your home is two-storied, then shelter from the mudslide in the upper story, but don’t shelter in the attic, as you won’t have a means of escape. Even if your home is destroyed by the mudslide, chances are that the upper story will be carried away, floating on the surface of the mud. While that won’t be a fun ride, you should be able to survive. You don’t want to be outdoors at all during a mudslide, unless you happen to be well away from where it is happening. Mudslides move rapidly, like an avalanche. There is no practical way you can count on outrunning it. Your only chance, if caught outdoors, is to find someplace to shelter. That means getting into a building and getting to an upper floor. If you are forced to run, to get out of the path of the mudslide, then run crosswise, across the face of the mountainside. This will get you out of the path of the mud, raster than running downhill. The mud is going to take the easiest path downhill, so if you find yourself in a bit of a valley or canyon, try to get to a spot where you are on higher ground. Once the mudslide is over, our natural inclination would be to head right back home and see if our home has survived. If it didn’t, we’ll want to start salvage operations, finding what we can of our possessions, before it is too late. But that’s exactly the wrong action to take. Remember, your life is worth more than any material possession that you own. Just because the mudslide has stopped, doesn’t mean that it is safe. Another mudslide can very easily follow the first, burying you, as you are trying to salvage your possessions. Wait until officials tell you that it is safe to return to your home. There isn’t a whole lot you can do to make your home more mudslide resistant. Your greatest protection isn’t the home itself, but where you have it located. If you’re looking to build or buy, take a critical look at the location, not only for protection from mudslides, but also from other potential disasters. Selecting the right location for your home or survival shelter can make a major difference in the home or shelter’s survivability. If you already own your home and are concerned about the potential of a mudslide, you might want to consider building a concrete or concrete block retaining wall to help protect it. As you can see in the videos from the California mudslide, a normal fence isn’t going to do much to protect you. But a well-built cement wall, with a firm foundation, can turn that mudslide aside, seeking a route around your property, especially if it is built at an angle to the natural flow of the mud. Another useful home-building tactic, which can help with a number of different disaster scenarios, is to have your home’s plumbing and lines modified to have flexible fittings. PVC pipe is already somewhat flexible, but PVC connectors aren’t. Flexible connectors can help ensure that your pipes don’t break, if you are ever faced with a natural disaster. Finally, be ready to treat any injuries that family members and neighbors incur. A good trauma first-aid kit and the knowledge to use it properly, can save lives. No matter how quickly rescue workers can get there, you’re already there. So whatever first-aid you can render, will increase an injured patient’s chances of survival. Previous PostHelp! It’s Winter and my Chicken is Molting!